As yet the newspaper in which this piece appeared has not been identified—if you recognise it please let me know! It was the beginning of the Civil War, the breach between the King and his Parliament gradually became widened, and early in 1642 Charles had removed his Court to York. Here he received a petition from Lancashire signed by numerous knights, divines, and some 7,000 freeholders, in which they expressed their satisfaction in the measures taken by the King, but regretting " the distance and misunderstanding between Your Majesty and Your Parliament." The King having made a last attempt to come to terms with the House of Commons, and failing in this, Parliament ceased to ask for the Royal Assent to their Bills, and by order of their own took full command of the militia. Negotiations having come to an end. Charles raised his standard at Nottingham, August 22nd, 1642. This great civil strife was not one war but many wars, and the trouble had begun in Lancashire before the King had declared war at Nottingham. The first outburst took place at Preston, when the High Sheriff called a meeting and had read the King's reply to the petition already mentioned. This meeting broke up in great confusion, the greater number of people rallying round the opposition. This same High Sheriff, having surprised the garrison at Preston and seized all the powder in the magazine, and Lord Strange, soon after to become the seventh Earl of Derby, having done the same thing at Liverpool, they both repaired to Bury. This so alarmed tne people of Manchester that they immediately took up arms, to the number of some 7,000 men. Here it is that the subject of this short sketch comes into prominence, Sir Thomas Tyldesley, of Myerscough Lodge, near Preston. He, along with Lord Strange, paid a visit to Manchester, ostensibly to attend a banquet. During the dinner a Parliamentary force entered the town, and beat to arms. Tyldesley and Strange, with a small retinue, turned out, and a riot ensued, then the long struggle between the Monarchy and the Parliament may be said to have begun. Tyldesley took an active part on the side of the King, raising at his own charge regiments of horse, foot, and dragoons, in command of which he served with distinction at the battle of Edgehill. His next notable exploit was the storming of the town of Burton-on-Trent, and for this he received the honour of knighthood, and was made a brigadier. Later he was in command of a division of the army besieging Lancaster with the expectation of a quick surrender of the place when the Royal forces were totally defeated at Preston. August 17th, 1648. Obliged to retreat to the North, Tyldesley joined others of the Royalists at Appleby. Here, finding defence impossible, he along with others surrendered on October 9th, 1648, on terms which required the officers to go beyond the seas, and meanwhile to observe all ordinances and orders of Parliament. Passing over to Ireland, he later returned with troops to join Charles II in his advance into England. 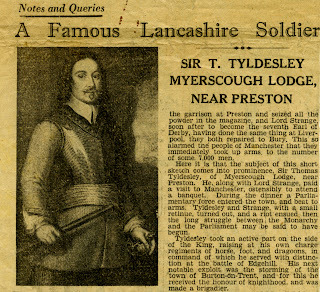 The King sent word for him to hasten to him in the summer of 1651, when he, the King, was actually quartered at Myrescough Lodge, Tyldesley's home. 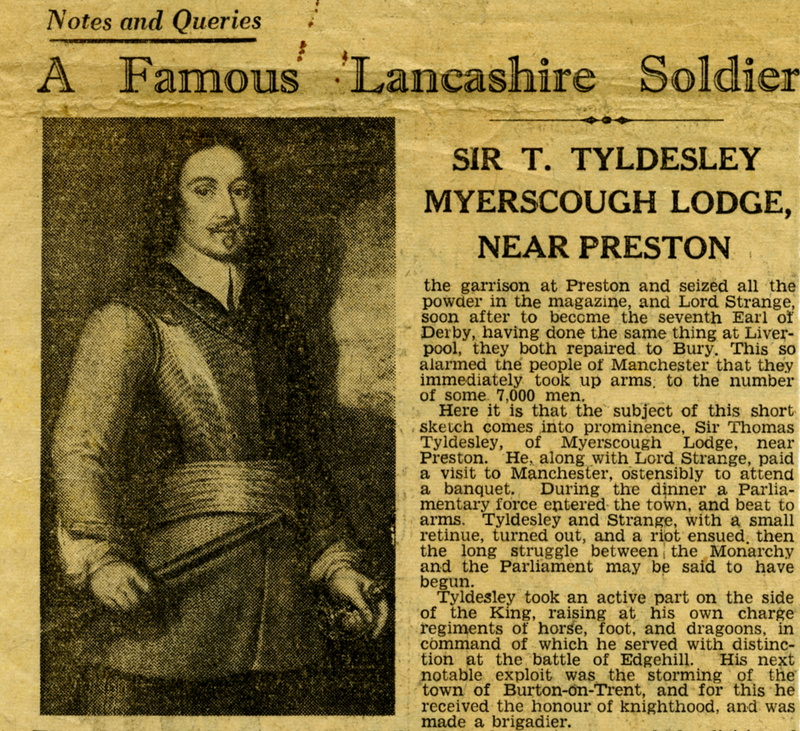 In that same year, Tyldesley was killed in a desparate engagement at Wigan Lane, the Royal army losing nearly half its officers and men, and was totally defeated. The illustration reproduced here, is from a steel engraving, dated 1836, kindly lent by Mr. David Watt, of Hutton. It is taken from a picture in the possession of Sir William Hulton of Hulton Park, near Bolton. In order to visualise what the Civil War meant, I will just mention what took place near home. The Parliamentary forces being at one time in possession of almost the whole of the county, much plundering took place in the Fylde district cattle being taken and houses sacked, and sometimes burnt, and I need hardlv mention the memorable siege of Lathom House. Greenhalgh Castle, near Garstang, or the part that Clitheroe Castle, etc., played during this terrible time. Nothing now remains of the original structure of Myerscough Lodge except a few moulded stones built into the fabric of the present building of that name, which stands on the same site as the original.It will perhaps be of interest, to some of my readers, to know that Sir Thomas Tyldesley was buried in his own chapel of St. Nicholas in the Church of Leigh—where a monument covers his remains.—A.W.